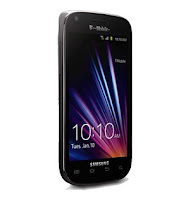 Samsung and T-Mobile USA have announced the Galaxy S Blaze 4G at the 2012 Consumer Electronics Show. The latest smartphone from Samsung, the Galaxy S Blaze 4G will be the third smartphone to take advantage of 4G technology (HSPA+42). T-Mobile Samsung Galaxy S Blaze 4G comes with a Qualcomm Snapdragon S3 processor with 1.5 GHz dual processors, a brilliant Super AMOLED touch screen, HSPA+ 42 Mbps downlink speeds, and a variety of pre-loaded entertainment. Commenting on the news, Andrew Sherrard (senior vice president, marketing, T-Mobile USA) said: "Consumers want the accessibility and entertainment capabilities that smartphones offer, and we’re committed to providing a range of 4G device options. The Samsung Galaxy S Blaze 4G is the latest smartphone that enables consumers to unlock the full potential of T-Mobile’s faster 4G network. With a compelling set of entertainment features, paired with our Unlimited Value and Monthly4G plans, we’re continuing to make it easy and affordable for consumers to experience the benefits of 4G." T-Mobile Samsung Galaxy S Blaze 4G is expected to be available later this year. Additional details will be revealed closer to availability. 0 comments on "Samsung Galaxy S Blaze 4G for T-Mobile unveiled at CES 2012"